In 1991, Signs Now pioneered the computer-designed signs concept and led a revolution in the way signage is produced. Today, our professional team has access to the most advanced training systems and technology in the industry. As a result, we provide the special care and close personal attention you can expect from a local business owner, while our network provides global resources to effectively execute graphics, banners and signage projects of any scope. Our commitment is to help your business get noticed! Contact or visit our Redlands location today to explore how your business can benefit from the Signs Now Advantage. 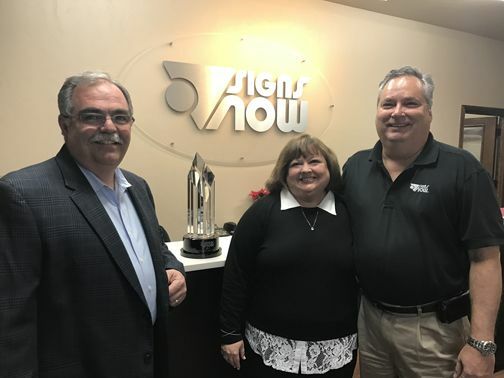 Eugene and Paula Montanez have been in the signs and printing business for over 40 years, serving hundreds of business owners in Southern California. Their experience in marketing, indoor and outdoor signage will be an asset to your business. Eugene has extensive ADA signage experience to assure your compliance with the latest laws and regulations. Paula can help you design the perfect sign or trade show display to showcase your business. They are both at your service, along with their team of customer service and production professionals. Both Eugene and Paula have grown up in the Inland Empire and been active members of Rotary and Soroptimist, as well as multiple Chambers of Commerce in the Inland Empire. Wendy has worked in the industry for over 25 years and has been with us for almost 6 years. She has three children and lives in the Rubidoux/Jurupa Valley area in Riverside County with her husband and family. Wendy is very customer-focused, and often hear them singing her praises. She enjoys working here and feels best when she knows that she has satisfied yet another customer! Lina has been with our company since 1999 and has served the sign and print industry even longer! She has three children and lives in Lake Elsinore with her husband, children, cat and two adorable French Bull Dogs named Pebbles and Bam Bam. She is an amazing Project Manager and our customers love working with her due to her knowledge and professionalism. Wanda has been with our company for over 19 years. She has four children, two grandchildren and lives here in Corona with her family, including one dog and three cats. Wanda is an expert in the fine arts of bindery finishing and all the final touches that perfect the finished product. Her friendly face represents us very well as she delivers print and signage jobs to satisfied customers all over town! Marcos has worked in the industry since 1994 and has extensive knowledge of print and sign processes. He has been a valuable asset with us since 2011. Marcos has three sons and two daughters and lives in Winchester with his family. His favorite thing about his job is seeing the result of his creativity process. Our customers are always amazed at his craftsmanship and friendliness. With a strong background in marketing and customer service, Aimee joined us in 2015 to help spread the word about our amazing brands and products. Aimee has two sons, a stepdaughter and one granddaughter, and lives locally in Corona with her family. She gets truly excited when her marketing efforts bring results and loves hearing about our customers growing their businesses with our help. When you need custom signs, custom banners, full color vehicle graphics or monument signs, you can count on Signs Now Redlands. We deliver professional sign solutions to local businesses and organizations. We are a full service sign company that can help with each step of your advertising project. 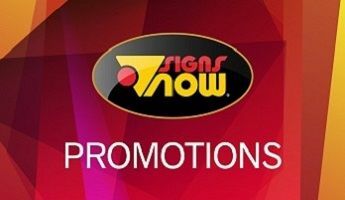 Whether you need to signs for a construction site, a tradeshow booth or run a store sales event, Signs Now Redlands will provide you with unique and effective signs to ensure your success. As a full service company we help our customers with design, installation and maintenance of our professionally manufactured signs and graphics. At Signs Now Redlands we listen to our clients and deliver signs and graphics that support our customers’ goals and objectives. Signs Now Redlands is a modern sign company that uses advanced technology to produce efficient high quality signs and solutions. Our talent, expertise and industry experience can meet the signage needs of our clients when they need to run a corporate event, political campaign or a grand opening.